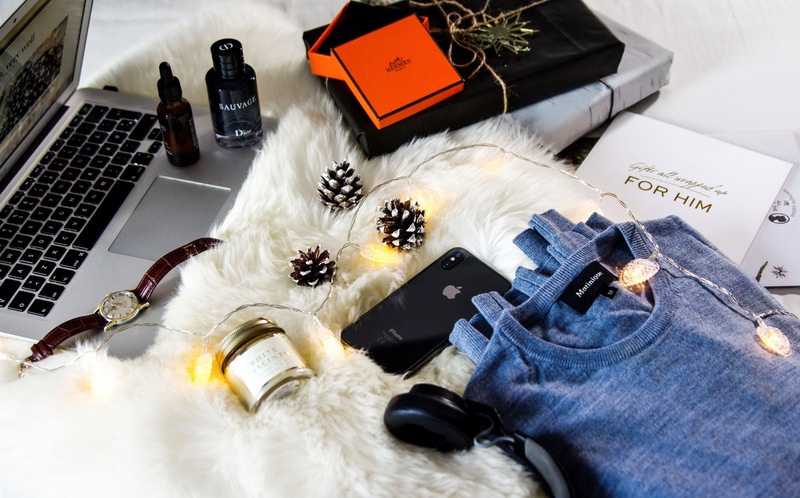 This post is now updated with new gift ideas for him, HERE. Time for some holiday special gift guides! And who shall we start with first? Well, I thought men would be a good idea. Whether it’s your partner, father, friend or coworker, from my experience men are not easy to shop gifts for. There are of course some that are easier than others, those that are happy with some clothes and accessories. But then there are those men that are always the hardest on your list to find something for, right? What can you buy to a man that has everything? Well, in today’s gift guide I am sharing 15 different blockbuster gift ideas that will put a smile on the men in your life. From clothes and accessories, to hobbies and fun tech equipment. Aaaand, as a bonus – you can check the Easy Gift Wrapping ideas for christmas presents to give the gift a personal touch and make it more special. Canon EOS REBEL T7i EF – S $900 (sold out!) it has build in wifi and bluetooth. Splurge alert! This is a gift that the men in your life will cherish forever, one of my friends got a similar camera for Christmas and he’s been talking about it the whole year. The Suede moccasins $80 – do you know someone that would enjoy a pair of very comfortable and warm shoes to have while enjoying hygge at home? These are the perfect ones. Tiger sport socks $8– is there a man that doesn’t need socks? I think this is a gift that you can’t go wrong with. Daniel Wellington Watch or in golden HERE – their classic version, fit for every taste and occasion. Black Leather wallet $100 – very modern, simple and stylish. Brown leather laptop bag $30 – I gave one like this to my boyfriend last year and he wears it all the time. It makes it easy to carry a laptop, papers, wallets and so on. Plus, it’s really beautiful as well. Knit gloves $24 – if you are in doubt, just check if he is in need of some winter accessories, we all need them to stay away from cold right? The ordinary granactive retinoid 2% in squalene – this serums are very famous for their quality and efficiency, I myself own one and I am very happy about. Echo Dot (2th generation ) didn’t knew what this was at first first but now i am quite intrigued. It’s a handsfree voice controlled device that uses Alexa to play music, control smart home devices, make calls, send and receive messages, provide information, read the news, set alarms, read audiobooks from Audible, control Amazon Video on Fire TV, and more. Isn’t this the best? Leather boots $54 (sold out but similar HERE)- perfect boots to help transitioning from a casual outfit to elegant outfit. They work great with both work outerwear and casual wear. The iPhone plus wallet case $50 – there is something about a iphone case and wallet case all in one that men just love. It’s easy to carry around, they don’t have to worry about where their wallet is and this one can be monogramed. Sony Noise cancelling speakers under $50 – do you know a man that listens to music all the time whenever he goes somewhere, or a man that loves to travel? Then I am sure he will appreciate these speakers. The camel wool coat $127- a coat is a necessity both for women and men, I particularly like the camel coats because they show a bit of personality, are versatile and easy to wear. Retro Thermos $39– with this he’ll be able to have warm coffee all the time, everywhere he goes. And not only coffee, but also tea, hot soup and in the summer it can keep ice tea and lemonade ice cold. Faux leather backpack $39 – all men love a nice backpack that they can carry around, especially one like this that has the perfect fit and size and a versatile color. Which of these gifts you would you like to give to the men in your life? Anything else I missed?